I had a good workout yesterday at the gym. I kind of got a late start, I thought I was going to meet my trainer at the stairs, that’s what we typically do on a saturday. It was a gorgeous day at the beach and it was a little crowded, which is expected on such a beautiful day. Then I get a text from my trainer asking me where I am… She is at the gym, which is about 20 minutes away from where I was currently… The stairs are easy. How many times can you run up & down them? 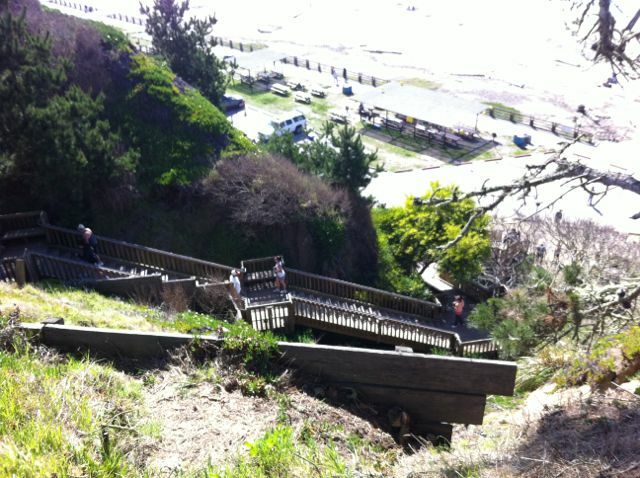 There are about 8 flights of stairs to get from the parking lot to the beach. It’s harder than you think. the workout was fairly simple, no complex exercises. Just some basics that worked your core torso area and back. I had a brief warmup and then we jumped right into the strength round. The strength round consisted of 3 round of 3 exercises; 16 dumbbell wood chopper @ 20 lb, sit-ups holding a 25 lb plate overhead with straight arms, and a 1 minute plank, no breaks. Not too hard, but enough to work up a sweat. The dumbbell wood chopper works like this: Take a barbell, one end on the floor, the other held in your hands with arms straight at about a 45 degree angle. I use 2 10 lb weights on the raised end of the barbell for more resistance. Keeping your arms straight, swing the barbell down to your waist in an arc to one side. Repeat on the other side, each side is one rep. I do a total of 16 reps, 8 per side. The sit-ups with the plate is an easy form. It’s a regular sit-up but you are also holding a 25 lb plate over your head with your arms straight. I did 12 reps for each round. The plank… that’s self-explanatory. Just had to hold it for 1 minute. wall ball with a 18 kg ball. jump squat – do a standing long jump followed by a front squat. These types of routines always wipe me out. You would think that my legs would be worked pretty hard, but today, they feel pretty good. My back on the other hand is really sore. I have had to take it easy on the back for a while now after a pulled muscle on the rowing machine back in December. This was also the last work out at my current gym. This week I start training at a new gym tailored exclusively to cross fit training. I have been told by my trainers other clients that it’s pretty cool. I am looking forward to it. Not only the new equipment, but the availability of new routines to learn should be really interesting. ← I love cross-fit training.